More than four months after New York City and state implemented the landmark “Raise the Age” law, questions, criticisms and vagaries persist. One Queens judge in particular is helping address those issues. Supreme Court Justice Chereé A. Buggs has partnered with a diverse cohort of Queens stakeholders for a forum on Monday, Feb. 18 to educate residents about the measures and to receive feedback from the community. The event will take place during the 113th Precinct Community Council meeting at New Jerusalem Baptist Church, 122-05 Smith St. in Jamaica. In late-September 2018, the city moved all children out of adults jails in New York City and into a juvenile detention center in the Bronx ahead of the Oct. 1, 2018 enactment of Raise the Age. Raise the Age also removes the majority of, but not all, criminal cases involving 16- and 17-year-olds to Family Court. Buggs worked with Office for Justice Initiatives Deputy Chief Administrative Judge Edwina Mendelson to develop the forum, where attendees can ask questions and discuss the rollout of Raise the Age. The Office of Justice Initiatives oversees Raise the Age. 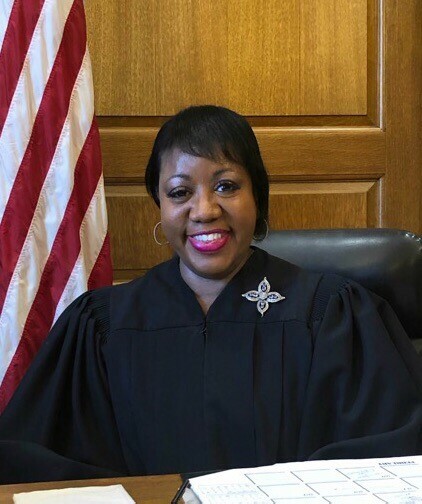 In her capacity as Supreme Court Justice, Buggs, a lifelong Queens resident, presides over various civil matters with monetary claims above $25,000. She also handles medical malpractice trials, foreclosure proceedings, uncontested matrimonial matters and claims for equitable relief. In addition, she occasionally presides over Mental Hygiene Part hearings involving Mental Hygiene Law Article 9 and medication/medical procedures over the objection of patients. Buggs is uniquely suited for work in the Mental Hygiene Part because of her previous legal career. From 1991 to 2002, she represented city hospitals — including eight years representing Jamaica Hospital Center — in State Supreme Court hearings where the hospital sought court orders for medical treatment, continued hospital retention and assisted outpatient treatment for patients with mental illness under Kendra’s Law. Buggs started out working for the Human Resources Administration shortly after earning her law degree because, she said, she was drawn to the “meaningful work.” She has also served as legislative attorney to the City Counsel, a member of the city’s Equal Opportunities Employment Commission and an administrative law judge for various city agencies. She joined the Family Court bench in 2008 and, in addition to presiding over cases, developed the domestic violence quilt project, which features designs by survivors of domestic violence and members of the victim assistance organization Safe Horizon. The quilt still hangs in the lower atrium of Queens Family Court. In 2009, she moved to Civil Court and later served as an acting Supreme Court Justice from 2012 to 2016. Buggs was elected to the Supreme Court bench in 2016. The Raise the Age forum she organized with Mendelson will feature a handful of assistant district attorneys from the Queens District Attorney’s Office, Corporation Counsel Colleen Babb, Legal Aid attorney Samantha Seda, NYPD Lt. Kishon Hickman and Department of Probation representative Stacye Desamours. Buggs said she and Mendelson have also partnered with local sororities and fraternities, the NAACP, the Macon B. Allen Black Bar Association, LIFE Camp Inc. and Project H.Y.P.E.